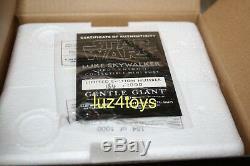 This listing is for a 2018 SDCC Exclusive Gentle Giant LUKE SKYWALKER ROTJ Bust with light up saber. 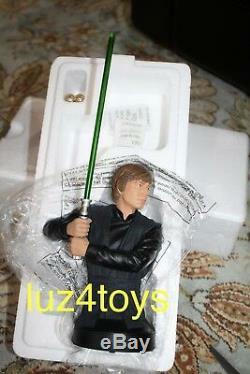 For this brand new Comic Con exclusive mini bust, the artists at Gentle Giant LTD have captured the surprise, dramatic moment in Star Wars: The Return of the Jedi where new Jedi Luke Skywalker ignites his new hand-crafted GREEN bladed lightsaber for the very first time in the original trilogy! 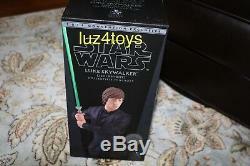 You can also ignite Luke Skywalkers green lightsaber! For the second time in Gentle Giant history we have included a switch activated light-up Lightsaber in one of our mini busts! To celebrate the 35th anniversary of Star Wars: The Return of the Jedi this dynamic, new 1:6 scale Luke Skywalker (Jedi Knight) mini bust was designed, modeled and prototyped using top of the line 3D technology. Each collectible mini bust is hand-cast, hand-painted and hand-numbered with a limited edition Certificate of Authenticity. The Edition is #184 of 1,000. The Bust is Brand New in box (Never displayed) just open to inspect and take pictures. Box is in good condition (See picture). Unless otherwise stated I open and inspect all Collectibles. /statues to make sure there are no defects/ Breaks. Just because a statue is factory sealed doesn't mean it isn't broke. Being a collector myself I have received many statues factory sealed that were broken. All my sales are final. These charges are the BUYERS responsibility. I will not mark merchandise value below the price paid for the item. Some countries have maximum values that a package can me insured for. Check with your local post office. The item "2018 SDCC EXCLUSIVE GENTLE GIANT LUKE SKYWALKER ROTJ BUST WITH LIGHT UP SABER" is in sale since Sunday, August 12, 2018. This item is in the category "Collectibles\Science Fiction & Horror\Star Wars\Products, Non-Film Specific\Statues, Busts, Characters\Other Star Wars Characters". The seller is "cmastand5" and is located in Franklin Square, New York. This item can be shipped to United States, Canada, United Kingdom, Denmark, Romania, Slovakia, Bulgaria, Czech republic, Finland, Hungary, Latvia, Lithuania, Malta, Estonia, Australia, Greece, Portugal, Cyprus, Slovenia, Japan, China, Sweden, South Korea, Indonesia, Taiwan, South africa, Thailand, Belgium, France, Hong Kong, Ireland, Netherlands, Poland, Spain, Italy, Germany, Austria, Israel, Mexico, New Zealand, Philippines, Singapore, Switzerland, Norway, Saudi arabia, Ukraine, United arab emirates, Qatar, Kuwait, Bahrain, Croatia, Malaysia, Brazil, Chile, Colombia, Costa rica, Panama, Trinidad and tobago, Guatemala, Honduras, Jamaica, Antigua and barbuda, Aruba, Belize, Dominica, Grenada, Saint kitts and nevis, Saint lucia, Montserrat, Turks and caicos islands, Barbados, Bangladesh, Bermuda, Brunei darussalam, Bolivia, Ecuador, Egypt, French guiana, Guernsey, Gibraltar, Guadeloupe, Iceland, Jersey, Jordan, Cambodia, Cayman islands, Liechtenstein, Sri lanka, Luxembourg, Monaco, Macao, Martinique, Maldives, Nicaragua, Oman, Peru, Pakistan, Paraguay, Reunion, Bahamas, Viet nam, Uruguay.